Hybrid Camera Revolution: In NYC? 4K Blackmagic Production Camera Demo on Feb. 11th! In NYC? 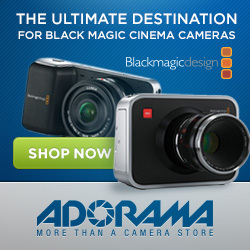 4K Blackmagic Production Camera Demo on Feb. 11th! Thinking about ordering $3995 Blackmagic Production Camera and want to actually see it before you pull out your credit card? If so, and if you're in the New York City area, you can see the camera and demo footage in person, at the Moving Picture Collective ("Mopictive") meeting at AbelCine in the City on February 11th at 6:30 PM. The Diamond Brothers have been shooting with a beta version of the camera for a while, and have some demo footage to show, along with the camera. Looks like the ship date for this camera is getting close. And with the upcoming Panasonic GH4K announcement and the new Sony AX100 shipping in March, this could be the real beginning of the affordable 4K "Ultra" HD era. Sounds like a lot of fun, and I wish I could be there. If anyone in the area does go, please post pics and your impressions in the comments section ! And, if seeing the camera in person moves you to pre-order the camera, please come back to the blog and click on one of the links above or the display ad below, thanks!